The last village in Mattertal with a more posh than mountaineering atmosphere, Zermatt is nothing like I pictured it. Expensive, with fancy restaurants and bars, luxurious shops such as Monclare, Rolex, Patek, etc. I’ve never imagined someone to go in a sky resort and be like: “I think I forgot my watch at home. Let me just buy this 50K Piguet and then we’ll take the chopper and hit the slopes”. I wonder how St. Moritz looks like. Even the mountain equipment is above the retail price. Nevertheless the village is at the foot of Matterhorn and it can’t get better than this. Or maybe without the endless annoying mini taxis. There are a lot of cable cars and trains going up the mountains. Plenty of treks to be done. You can even sky in the summer. There’re two supermarkets but both close before 8 p.m. Most of the restaurants are open till midnight and bars/pubs even later on. Hotels prices are in general above the Swiss standard, but cheaper accommodation can be found. There are even 2 hostels if you fancy sharing. Since I don’t, a hotel was the only option. 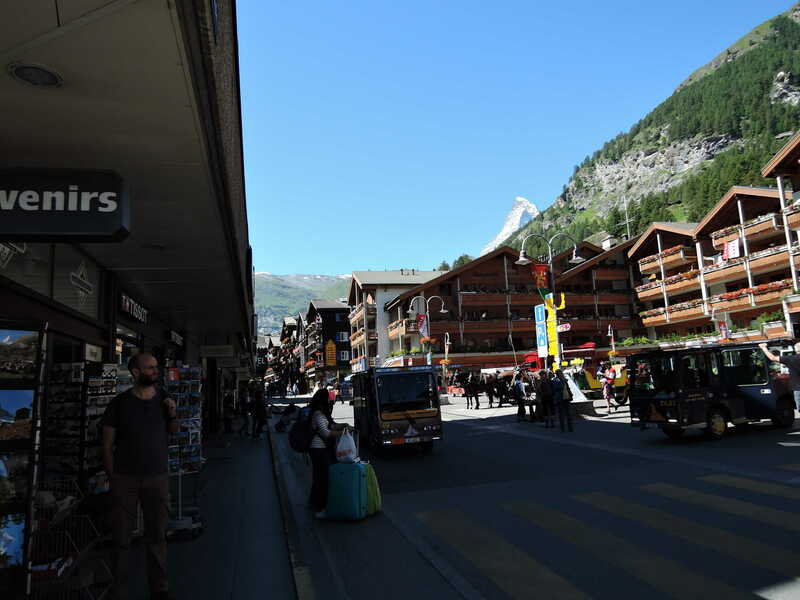 I booked the cheapest one that looked decent enough – Hotel Alfa Zermatt. 5 minutes from the train station, close to supermarket and with breakfast included at their 4* hotel. 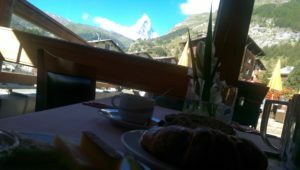 Splendid view over Matterhorn and the staff was exceptional. The room was clean, but with an oldish look. Bathroom was shared but I never had to queue. Two balconies with both Matterhorn and river views, but no chairs or table though. It’s a good value for money if you are not extremely fussy. The trek itself it’s a 9.3km circle and it starts at either Blauherd or Sunnegga. Depending whether you want to descend or ascend. It takes about 2-3 hours to complete but you should allow at least half a day to enjoy the views, maybe even have a picnic and swim. It’s pretty easy and even kids can do it. 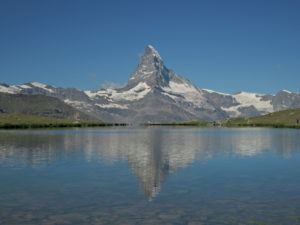 It can be done directly from Zermatt by hiking, but one should add another 2 hours to the trip. Add another 2 if planning to return the same way. Alternatively there is a funicular to Sunnegga and then cable car to Blauherd (2571m). I didn’t have much time available so I went for the easier way. The ride takes about 15 minutes. In fact I only managed to do 4 of them. On a clear sky day, the views are spectacular. Each lake has it’s own charm and beauty. At start the trail is well marked with directions, and sometimes times, for each of the lakes. There are a few construction sites for new cable cars and at some point the route become somehow unclear. The cable car station has free WIFI and toilets. Make sure to use them before leaving as there are none on the trek. As you follow the signs and the endless groups of Asian tourists, you shortly arrive at Stellisee. Crystal clear water, reflections of Matterhorn and views over the glacier valley surrounded by snowy peaks. The far end of the lake is pretty dirty though. There were a few people fishing, however swimming is not allowed. As you descent in the valley , about 30-40 minutes later you reach Grindjisee. This must be the most beautiful of all. Fed by a glacial stream with clear clean water and lots of fish. 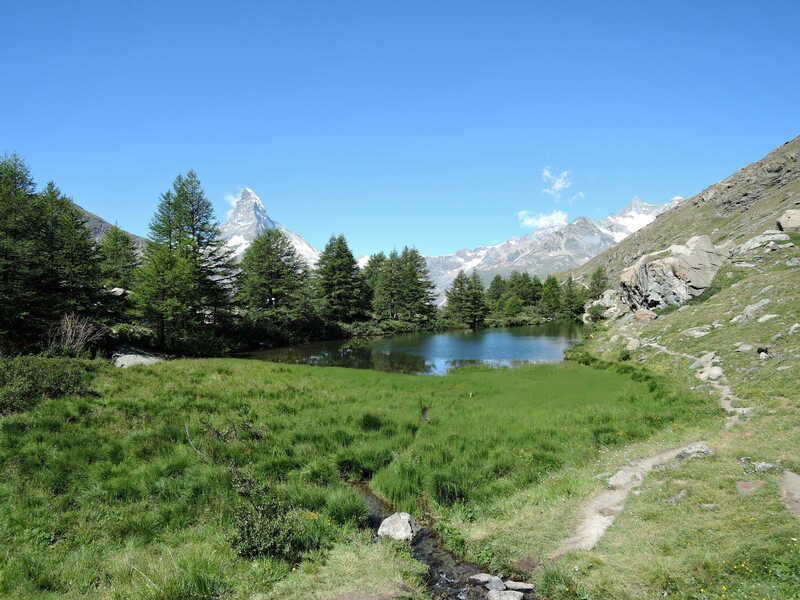 Hidden inside a small coniferous forest it offers views of Matterhorn. A perfect picnic spot. As you go on the left side of the lake, the trail descends into the glacier valley. Or at least it used to be. Now there are only rocks and a few streams. You should pay attention as the unpaved road also serves as a bike track. After reaching the other side, it turns right and slightly ascends. 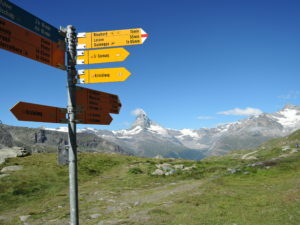 A signpost marks Grunsee to the left. Take the path uphill for a few minutes. Swimming is allowed so if you have time, go for it. The water is pretty cold though but you’ll get a free fish pedicure. There must be thousands of tiny ones and very friendly and curious. I just had to go in. Continue ahead keeping the right side of the lake. You should soon see the Berghaus Grunsee restaurant. The signpost is a bit confusing here and I did not find the trail to the next lake. I had to turn back and take another one. However i did spotted it from above later on. It seems to be running down into the valley through the forest, just right of the new cable car station. As it was late I skipped Moosjiesee. From above didn’t seem to have the charm of previous lakes. I continued my hike to Sunnegga, and as I approached the station, I came across Leisse. The last of the 5. Extremely crowded and the water quite dirty honestly. It has a small beach and a playground. It might be a favorite for parents, but not for someone who seeks a quiet relaxing place. My camera battery was depleted so I have no photos of the last two lakes. I rushed to the funicular as I was leaving to the airport. 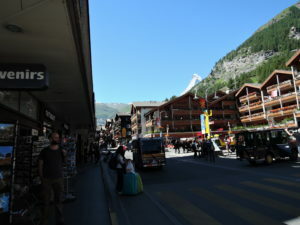 I did enjoy it and is a great place to spend the day if you are in Zermatt. For a short video make sure to check the Haute Route post.